How Do I Know How Big My Puppy Will Get? 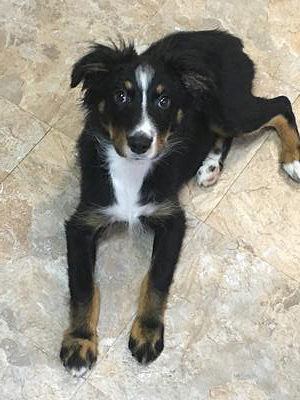 I have an Aussie puppy who is 16 weeks old. She's the sweetest girl and I love her to pieces. She had a rough start to life but is finally healthy and acting like a normal wild pup. I'm concerned about her size though. She was very under weight when I got her. At 7 weeks old she was 4.5 pounds. The vet we were seeing kept saying she would be a mini. Both of her parents are large though. She is now 16 weeks old, weighs 18lbs and is 12.5 inches tall at the shoulder. Does it seem like she's catching up? She's never been super interested in her food. She's a grazer and won't each much if I try to feed her on a schedule. She eats Wellness Complete Health Grain Free puppy food and averages 2 cups a day, sometimes only 1.5 cups, other days 2.5 cups. Is it normal for her appetite to fluctuate? I probably worry about her too much but I can't help it lol. She was on death's door when I got her. Comments for How Do I Know How Big My Puppy Will Get? Hello. I have an Aussie ...got him at 8 wks old. Both of his parents were large (55lb for mom / 65-70lb for dad). My boy is nearly 4 and he weighs 55lb. As for appetite (take what i say with a grain of salt) - my boy had a sensitive digestion during his first year (part of that was due to the fact that he was subject to a bad parasite infection that lingered causing weight loss)... anyway I actually supplemented his meals with raw goats milk, which added calories, proteins, fats, and probiotics! Fast forward to a year ago... I began feeding him 100% raw meat diet! He really filled out muscle wise after about 6 months into the food switch! Good luck with your lil one! Mine is 16 weeks and 18 lbs also. From a calculator I found online she will be around 32-35lbs. I'm hoping for 40 but we will see. Don't think there is an exact science to it.